Thank you for visiting the Terms and Conditions page of Superbike-Coach Corp. website. This page describes our legal agreement (the “Agreement”) governing your use of superbike-coach corp. website at http://www.superbike-coach.com (the “superbike-coach Corp Website” or “Website”). Superbike-Coach Corp hereby grants you permission to view, display, and download a single copy of the material on the Website, provided that: (i) your use of the Website as permitted is solely for your personal, noncommercial use; (ii) you will not copy, republish or rebroadcast any part of the Website in any medium, other than as expressly permitted herein, without Superbike-Coach Corp prior written authorization; (iii) you will not alter or modify any part of the Website other than as may be reasonably necessary to use the Website for its intended purpose; and (iv) you will otherwise comply with the terms and conditions of this Agreement. This permission shall terminate automatically without notice if you breach this Agreement. Upon termination, you must immediately destroy any downloaded and printed copies of the Superbike-Coach Corp Website or any portions thereof. 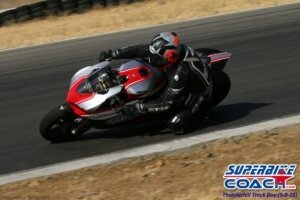 The original content of the Superbike-Coach Corp Website, including without limitation the text, software, graphics, photos, and images (“Content”), are owned by or licensed to Superbike-Coach Corp, subject to copyright and other intellectual property rights under United States Copyright Act, foreign laws, and international conventions. Superbike-Coach Corp reserves all rights not expressly granted in and to the Website and the Content. Other than as expressly permitted, you may not engage in the unauthorized use, copying, or distribution of any of the Content. If you download or print a copy of the Content for personal use, you must retain all copyright and other proprietary notices contained therein. You may not otherwise reproduce, display, publicly perform, or distribute the Content in any way for any public or commercial purpose. Certain names, logos and/or slogans contained in the Website, including all Superbike-Coach Corp logos and the marks “Superbike-Coach Corp.”, are the trademarks and service marks of Superbike-Coach Corp and/or its parent corporation. Such marks may not be used without the express written authorization from their respective owners. Nothing on the Website shall be construed as conferring any license under any of Superbike-Coach Corp or its parent’s trademark or other intellectual property rights, whether by estoppel, implication, or otherwise. The Superbike-Coach Corp Website may now or in the future permit the publication of communications or data posted by you and other users (“User Submissions”). Any User Submission that you post to the Superbike-Coach Corp Website shall automatically be deemed non-confidential. By posting a User Submission, you expressly grant Superbike-Coach Corp a royalty-free, perpetual, irrevocable, nonexclusive, worldwide license to use, reproduce, modify, publish, edit, translate, distribute, perform, display, and make derivative works of such User Submission, in whole or in part, and in any form, media or technology, whether now known or hereafter developed, and further including the unfettered right to sublicense such rights. You shall be solely responsible for your own User Submissions and the consequences of posting or publishing them. In connection with User Submissions, you agree that you will not: (i) post material that is copyrighted, protected by trade secret or otherwise subject to third party proprietary rights, including privacy and publicity rights, unless you are the owner of such rights or have permission from their rightful owner to post the material; (ii) publish falsehoods or misrepresentations that could damage Superbike-Coach CORP or any third party; (iii) post material that is obscene, defamatory, threatening, harassing, abusive, hateful or embarrassing to another user or any other person or entity; (iv) post advertisements or solicitations of business; (v) post chain letters or pyramid schemes; or (vi) impersonate another person. Superbike-Coach CORP does not endorse any User Submission or any opinion, recommendation or advice expressed therein, and Superbike-Coach CORP expressly disclaims any and all liability in connection with User Submissions. Superbike-Coach CORP does not screen communications in advance, and shall not be responsible for screening or monitoring User Submissions. If notified by a user of a User Submission that allegedly does not conform to this Agreement, Superbike-Coach CORP may investigate the allegation and determine in good faith and in its sole discretion whether to remove or request the removal of the User Submission. YOU AGREE THAT YOUR USE OF THE SUPERBIKE-COACH WEBSITE SHALL BE AT YOUR SOLE RISK. SUPERBIKE-COACH CORP PROVIDES THE WEBSITE AND CONTENT SOLELY ON AN “AS IS” BASIS WITHOUT ANY WARRANTY OF ANY KIND. TO THE FULLEST EXTENT PERMITTED BY LAW, SUPERBIKE-COACH CORP , ITS PARENT CORPORATION, OFFICERS, DIRECTORS, EMPLOYEES, AND AGENTS, DISCLAIM ALL WARRANTIES, EXPRESS OR IMPLIED, INCLUDING WITHOUT LIMITATION THE WARRANTIES OF MERCHANTABILITY, NON-INFRINGEMENT, AND FITNESS FOR PARTICULAR PURPOSE, IN CONNECTION WITH THE WEBSITE AND YOUR USE THEREOF. SUPERBIKE-COACH CORP MAKES NO WARRANTIES WHATSOEVER ABOUT THE ACCURACY, RELIABILITY, COMPLETENESS, OR TIMELINESS OF ANY CONTENT, SERVICES, SOFTWARE, TEXT, GRAPHICS, PHOTOGRAPHS, LINKS, OR OTHER MATERIAL CONTAINED IN THE SUPERBIKE-COACH CORP WEBSITE. SUPERBIKE-COACH CORP DOES NOT WARRANT THAT THE WEBSITE WILL OPERATE ERROR-FREE OR THAT ITS SERVERS ARE FREE OF COMPUTER VIRUSES OR OTHER HARMFUL CONTENT. SUPERBIKE-COACH CORP DOES NOT WARRANT, ENDORSE, GUARANTEE, OR ASSUME RESPONSIBILITY FOR ANY PRODUCT OR SERVICE ADVERTISED OR OFFERED BY A THIRD PARTY THROUGH THE SUPERBIKE-COACH CORP WEBSITE OR ANY HYPERLINKED WEBSITE, OR FEATURED IN ANY BANNER OR OTHER ADVERTISING, AND SUPERBIKE-COACH WILL NOT BE A PARTY TO OR IN ANY WAY MONITOR ANY TRANSACTION BETWEEN YOU AND THIRD-PARTY PROVIDERS OF PRODUCTS OR SERVICES. AS WITH THE PURCHASE OF A PRODUCT OR SERVICE THROUGH ANY MEDIUM OR IN ANY ENVIRONMENT, YOU SHOULD USE YOUR BEST JUDGMENT AND EXERCISE CAUTION WHERE APPROPRIATE. IN NO EVENT SHALL SUPERBIKE-COACH CORP, ITS PARENT CORPORATION, OFFICERS, DIRECTORS, EMPLOYEES, OR AGENTS, BE LIABLE FOR ANY DIRECT, INDIRECT, INCIDENTAL, SPECIAL, PUNITIVE OR CONSEQUENTIAL DAMAGES WHATSOEVER (INCLUDING WITHOUT LIMITATION LOST PROFITS OR DAMAGES RESULTING FROM LOST DATA OR BUSINESS INTERRUPTION) RESULTING FROM YOUR USE OR INABILITY TO USE THE SUPERBIKE-COACH CORP WEBSITE, WHETHER BASED ON WARRANTY, CONTRACT, TORT OR ANY OTHER LEGAL THEORY, AND WHETHER OR NOT THE COMPANY IS ADVISED OF THE POSSIBILITY OF SUCH DAMAGES. THE FOREGOING LIMITATION OF LIABILITY SHALL APPLY TO THE FULLEST EXTENT PERMITTED BY LAW IN THE APPLICABLE JURISDICTION. YOU SPECIFICALLY ACKNOWLEDGE THAT SUPERBIKE-COACH CORP SHALL NOT BE LIABLE FOR USER SUBMISSIONS OR THE DEFAMATORY, OFFENSIVE, OR ILLEGAL CONDUCT OF ANY THIRD PARTY, AND THAT THE RISK OF HARM OR DAMAGE FROM THE FOREGOING RESTS ENTIRELY WITH YOU. You agree to defend, indemnify and hold harmless Superbike-Coach CORP, its parent corporation, officers, directors, employees and agents, from and against any and all claims, damages, obligations, losses, liabilities, costs or debt, and expenses (including but not limited to attorney’s fees) arising from: (i) your use of and access to the Superbike-Coach CORP Website; (ii) your violation of any term of this Agreement; (iii) your violation of any third party right, including without limitation any copyright, property, or privacy right; or (iv) any claim that one of your User Submissions caused damage to a third party. This defense and indemnification obligation will survive this Agreement and your use of the Superbike-Coach CORP Website. Superbike-Coach CORP shall notify you of any such claim, suit, or proceeding, and may assist you, at your expense, in defending any such claim, suit or proceeding.